Over the sixty years of Josep Pla’s career, he became one of the great writers of Catalan literature in the twentieth century, revitalizing the Catalan travel narrative and consistently contributing to magazines and newspapers in Catalan and Spanish. His initial support for the Franco regime, and his liberal-conservative politics, led to his qualified rejection by the politically progressive Catalan literary community after the fall of Francoist Spain in the 1970s. He died in 1981, a year after being awarded a major literary award, the Gold Medal of the Catalan Parliament. His collected works, including The Gray Notebook (El quadern gris), continued to be published and translated after his death. The Gray Notebook begins, and ends, before all that, however. In November of 1919, a 22-year-old Josep Pla left Barcelona for Paris, by his own account a quiet, anxious, insecure young man with average looks, a changeable expression, and a cheap suit — and, the reader knows, a prodigious talent for description. 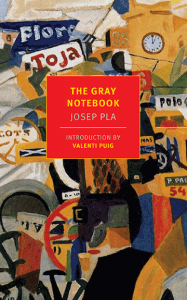 Twenty-one months earlier, on his twenty-first birthday, Josep Pla had begun his diary with the intent to “write whatever happens.” He would later call this diary The Gray Notebook after spending years revising and editing his juvenilia for publication. The Gray Notebook is devoted to descriptions of the landscapes around Barcelona, where Pla attended university, and Palafrugell, his hometown and where he spent much of 1918 during the influenza outbreak. It is also devoted to transcriptions of Pla’s conversations with his friends, his family, and overheard conversations among neighbors — as well as scattered fictional accounts, portraits of his friends and acquaintances, or descriptions of his writing practice. Peter Bush’s translation maintains Pla’s famous frankness and dry irony, not to mention Pla’s eye for detail in his illustrations of the Catalonian landscape (geographical and literary). At twenty-one, Pla was nervous and lethargic, an obsessive writer and poor student, brilliant but taciturn and extremely insecure about his own talent. “When these papers are published in thirty or forty years — if they ever are — how will readers react, that is, if they find readers with time on their hands?” wonders Pla. “I only ask one thing of this hypothetical reader: I ask him to read it slowly and calmly.” Fittingly — considering Pla’s sense of humor — this wish comes almost at the end of the book, in a series of remembered vignettes that appear to have been particularly formative for Pla’s practice of writing. When he began at university, Pla recalls, he was in the midst of what he saw as “a continuous literary failure” that stemmed from his attempts to write like the noucentistas who wrote elaborate, “highfalutin” prose and poetry. Instead, his editor told him, he should “follow [his] own temperament,” and write in a simple, unelaborate style, the way people speak. The Gray Notebook is an attempt to follow that directive. I feel like cardboard. My God! Vice leaves a bitter taste. Virtue brings sweet consolation. Alcohol does me untold damage . . . but I am always so thirsty! Besides, I turn to alcohol with the kind of expectation I find irresistible, driven by a longing for strong, stunning experiences. It wouldn’t be difficult to find similar passages, if not with such lovely, youthfully overwrought prose, in any young person’s diary (or, in our time, blog). Perhaps this is the true appeal of The Gray Notebook: for some, it might provide a window to Catalan culture, to Pla’s career, but for many of us, what we will see is ourselves.